Cisco today announced a refresh of its small business networking line, including routers and access points that (finally) support the current generation of Wi-Fi. The products are available immediately. While many small businesses use consumer-grade networking gear, the Cisco products announced today cater to those who demand greater support and security for both remote and local users, voice-over-IP phone systems, and cloud applications. The products may not be as inexpensive as their consumer counterparts, but they aren't outrageously costly either. They include two new routers, one with and one without Wi-Fi. The RV180 offers 4 gigabit ethernet LAN ports, 10 VPN tunnels (meaning 10 remote users can connect simultaneously), gigabit WAN connectivity, virtual LAN support (so you can manage which devices can access others on the same LAN), and VoIP support. It costs $180. For $246, the RV180W offers the same features as well as support for 2.4GHz 802.11n Wi-Fi. Additionally, the RV180W can be configured for use as a wireless bridge, repeater, or access point, which could give it a longer useful life if your network infrastructure changes. 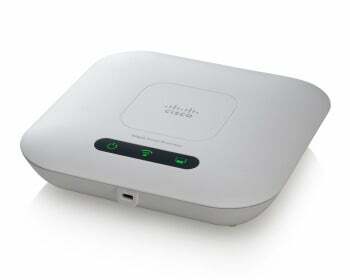 Cisco also is shipping two new 802.11n wireless access points. The $173 WAP121 supports 2.4GHz Wi-Fi and up to 4 SSIDs (businesses often use additional network IDs for different types of users--for example, you might create one SSID for customers and another for employees). It connects to your wired network via a 10/100 ethernet port, and uses power over ethernet (PoE) so you don't need to plug it into a power outlet. The $310 WAP321 supports selectable dual-band Wi-Fi (you can set it to support either 2.4GHz or 5GHz Wi-Fi) and up to 8 SSIDs. It connects to your LAN via gigabit ethernet, and also uses power over ethernet. A new unified communications offering, the UC320W, provides PBX-style telephone as well as networking support. It can service up to 24 phones with auto-attendant features, and has a built-in 2.4GHz 802.11n router and 4-port 10/100 switch, for $995. 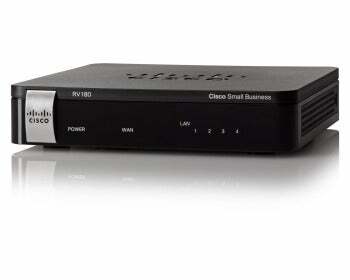 Cisco also announced two new VoIP phones for small businesses. The SPA512G ($194) and SPA514G ($219) phones support one and four lines, respectively. Both have built-in two-port gigabit Ethernet switches, so you can use them to connect other network devices. Cisco also offers a $62 802.11n Wi-Fi bridge (the WBPN) that you can attach to these and other Cisco SPA300 and SPA500 series VoIP phones to make them wireless. Finally, Cisco is also shipping a new line of managed and stackable switches, the 500 series, designed for larger businesses and small enterprises. These range in price from $590 to $5500.